Simone Serra, Scott Brieden, Blake Merriman, and Amanda Jones in Orion. Photo by Justin Chauncey. BOTTOM LINE: An engaging drama with comedic dialogue that focuses on the breakups and attempted reconciliations of two couples. 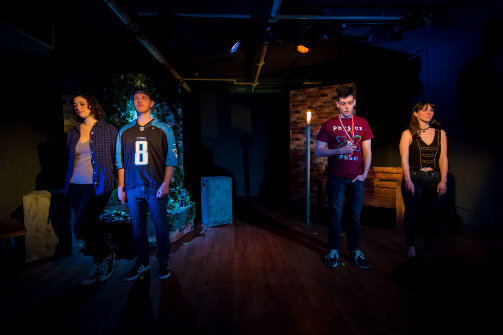 The old adage that your first heartbreak is always the most painful proves to be true in Orion, a play centering on recent college grads left stung by the emotional pain of their first loves. Sam (Blake Merriman) is set to go to graduate school in New York in order to follow his girlfriend Gwen (Amanda Jones) back to her home city. But self-absorbed Gwen snaps up a blogging gig at the last minute leaving Sam to turn down an impressive offer from Columbia. Sam is certain he has made the right decision, sacrificing his schooling for a lasting love, only to find that Gwen wants time and space, moving out of the apartment that they share. Left directionless, Sam manages to secure a chance to attend Columbia the following year, sure that Gwen and him just need time to work things out. Unfortunately, his wisecracking friend Scott (Scott Brieden) and his girlfriend Abby (Simone Serra) inform him, Gwen has secretly moved on and already has a new boyfriend. Meanwhile, Abby and Scott are mending things after a breakup: Abby realizes she carries the emotional weight of her previous damaging relationships and needs to trust Scott and the love that he has for her. Sam tries to move on and find a life after his breakup, but then Gwen realizes that she still has feelings for Sam and wants to know if he still feels the same. While the scenes of this play can be quite dramatic and sentimental, they are anchored by monologues in which the characters take turns directly addressing the audience and sharing their true thoughts and feelings. The lines delivered in these moments are the most insightful and well-written in the play and add depth and breadth to a play that might feel like a flimsy romantic drama without these looks into the characters’ interiors. Matthew McLachlan’s script also includes plenty of comedic dialogue, delivered to evoke maximum laughter. The well-designed set by Alaina Hernandez allows for the setting to change frequently while still including just enough to pull off each change (it also does much to maximize the space of the tiny studio on Theatre Row). The actors do a skillful job of capturing the many changes of heart and fears that envelop their characters, particularly Simone Serra as Abby. Scott Brieden as Scott also supplies plenty of comedic relief that lightens the entire mood of the production. However, the characters' youth makes their drama seem lesser, and perhaps placing these characters further on in their twenties might have given their problems more weight. When Abby claims to be held down by the weight of so many bad relationships, it's hard to take this as a serious problem if she dated Scott for the entirety of college. However, overall, Orion is an entertaining and engaging play that captures the intense emotions and confusion that accompany young love. Orion is by Matthew McLachlan. Directed by Joshua Werr. Set Design is by Alaina Hernandez. Lighting Design is by Christopher Annas-Lee. Sound/Music is by Enoch Porch. Stage Manager is Emily Thaler. The cast is Scott Brieden, Amanda Jones, Blake Merriman, and Simone Serra.